San Francisco, CA – September 8, 2016 – Research, development, and services nonprofit WestEd and the nonprofit NewSchools Venture Fund are proud to announce a grant from the Small Business Administration’s Office of Investment and Innovation Growth Accelerator Fund. 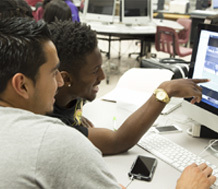 The grant will help expand capacity for sharing research and best practices with educators, entrepreneurs, funders, and other stakeholders involved in developing education technology. The two organizations began working together last year on the NewSchools Ignite/WestEd Research Partnership. NewSchools Ignite provides funding and management support to address market gaps and accelerate innovation in the K–12 edtech market. Informed by research and input from educators, this accelerator has spurred the development of technology-enabled tools in areas such as science and mathematics. Building on knowledge gained over the past year, WestEd and NewSchools will now establish an online portal with free resources designed to build startup teams’ understanding and use of iterative research, usability testing, and pilot studies in the product development process. Site visitors will also find training and assistance in research methods, opportunities to conduct research in education settings, and funding opportunities from the federal government. The partners will also develop data collection and analysis systems to help them and edtech entrepreneurs understand the impact and effectiveness of the work conducted in the accelerator. WestEd’s award was made under the Education Technology Research Topic, which focused on supporting accelerators in building the capacity of education technology small businesses to conduct research in the development and evaluation of new innovative products. The awards under this topic were made by the U.S. Department of Education’s Institute of Education Sciences (IES), in partnership with the Small Business Administration (SBA). WestEd is a nonpartisan, nonprofit research, development, and service agency that works with education and other communities throughout the United States and abroad to promote excellence, achieve equity, and improve learning for children, youth, and adults. WestEd has more than a dozen offices nationwide, from Massachusetts, Vermont, and Georgia, to Illinois, Arizona, and California, with headquarters in San Francisco. More information about WestEd is available at wested.org, Twitter, and Facebook. NewSchools Venture Fund is a national nonprofit that supports and invests in promising and innovative education entrepreneurs and leaders, and helps them accomplish their missions to achieve outstanding results for the schools, students and educators they serve. We are committed to helping students graduate high school prepared and inspired to achieve their most ambitious dreams and plans. Through our investing, management assistance, network building, and thought leadership, NewSchools helps to reimagine K–12 education.